Of all the Olympic sports, the triathlon has been the one that’s given me sleepless nights. 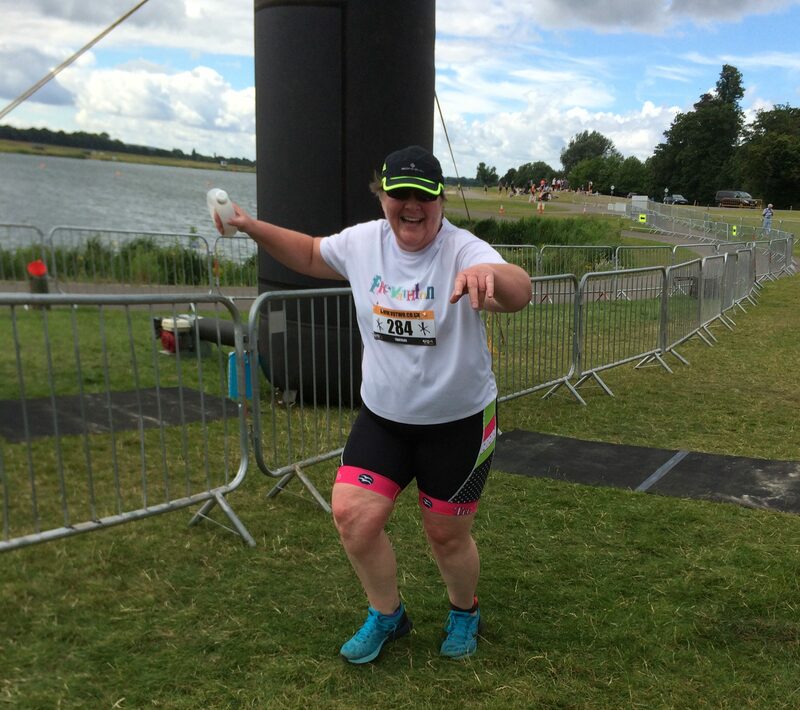 I wasn’t too concerned about the bike and run elements of the triathlon: completing two half marathons in seven days for the Freyathlon marathon had boosted my confidence I could run, and cycling has never not made me happy. It was just the swimming. 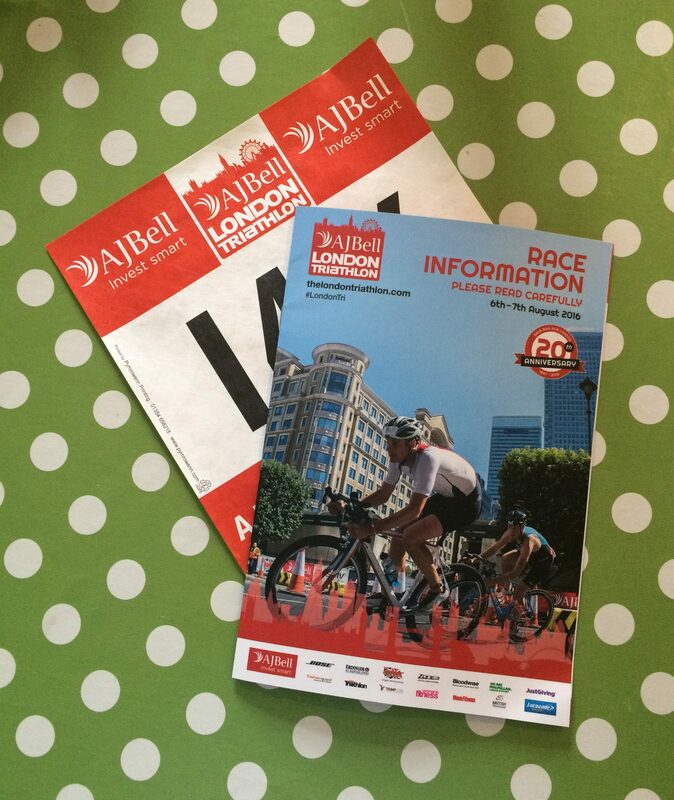 At the end of 2015, with the confidence of someone who’d never swum front crawl and never swum in open water, I registered for the AJ Bell London Triathlon. Only the world’s largest triathlon. In its 20th anniversary year. And I persuaded Trace to register too. As an Australian, her top swimming concern is usually about the colour and temperature of the water in England. And my inability to swim. I’ve never been keen on putting my face into water and only started learning to swim front crawl in January 2016. 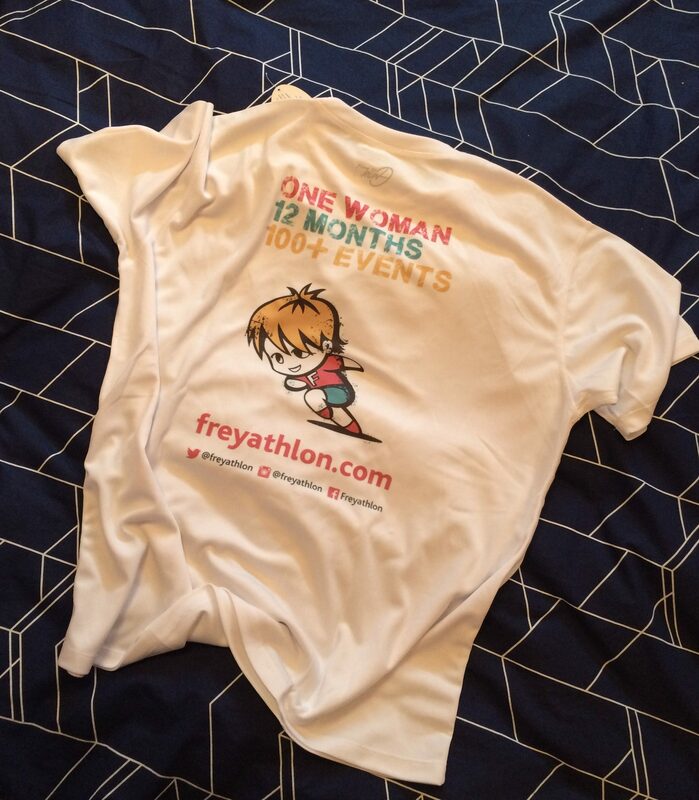 I made slow progress – and you can read about my escapades and patient coaches in the Freyathlon swimming. In March, Sarah from Cyclists Fighting Cancer contacted me. 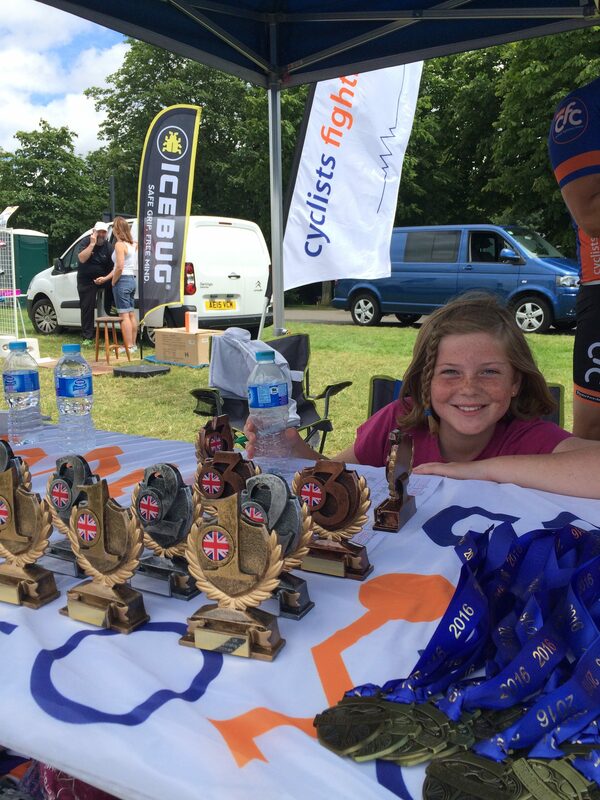 I’d already completed the Freyathlon track, road, and BMX cycling events but Sarah offered to help out with the mountain biking – and invited me to take part in the inaugural Cancer Sport UK Triathlon Championship. I said ‘yes’. And didn’t mention my recent achievement: swimming two lengths of front crawl in a 25m pool, almost without stopping. 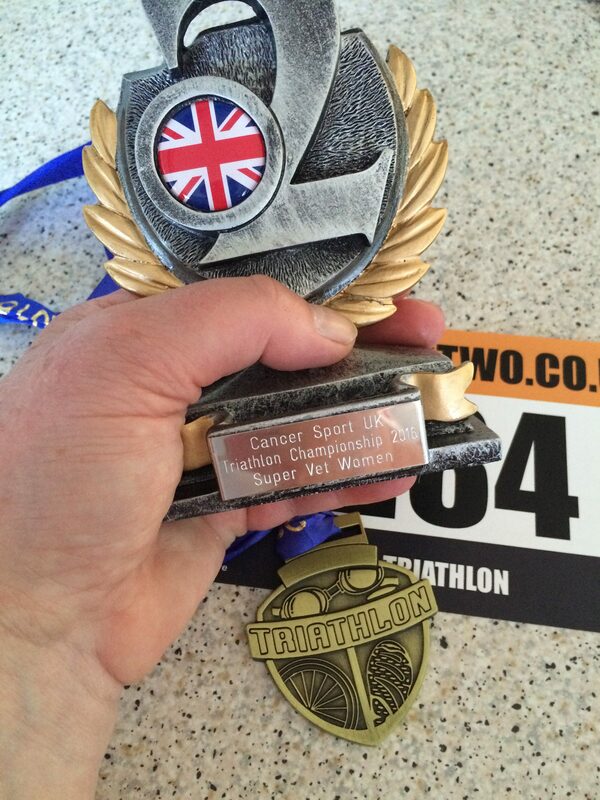 I now had two triathlons to complete. Three weeks apart. And less than four months to get triathlon-ready. 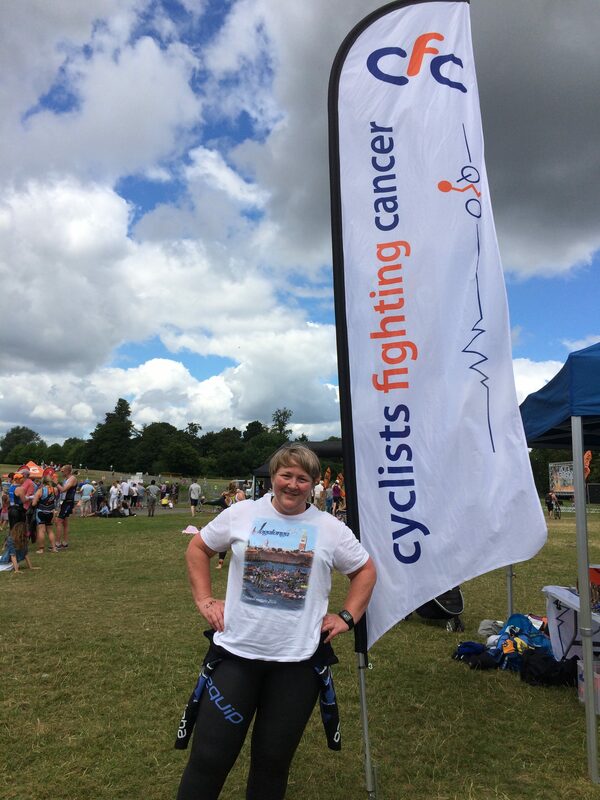 For Cancer Sport UK I’d be taking part in the super sprint distance: swimming 450m, cycling 10km, running 2.3km. 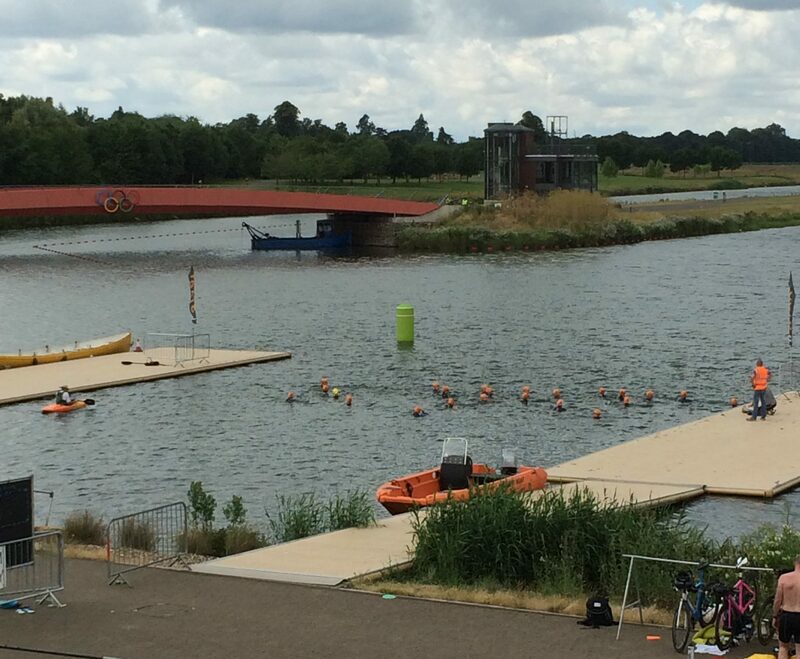 For the London Triathlon it would be the sprint distance: swimming 750m, cycling 20km, running 5km. Over the next few months I ploughed up and down the pool before and after work, building my stamina, and reassuring myself (and Trace) I could swim 750m. 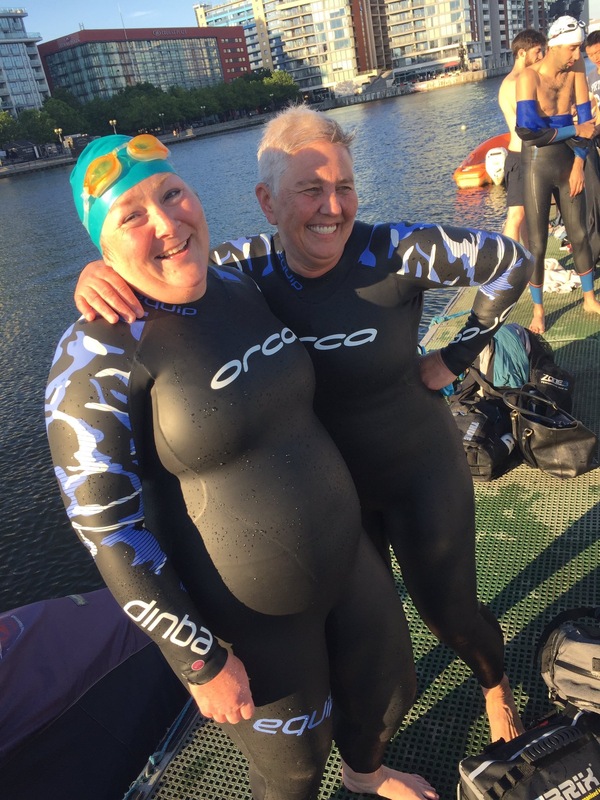 I bought a wetsuit and a trisuit (then a second trisuit because it was more comfortable), and, on the advice of a friend (Hello Adele!) 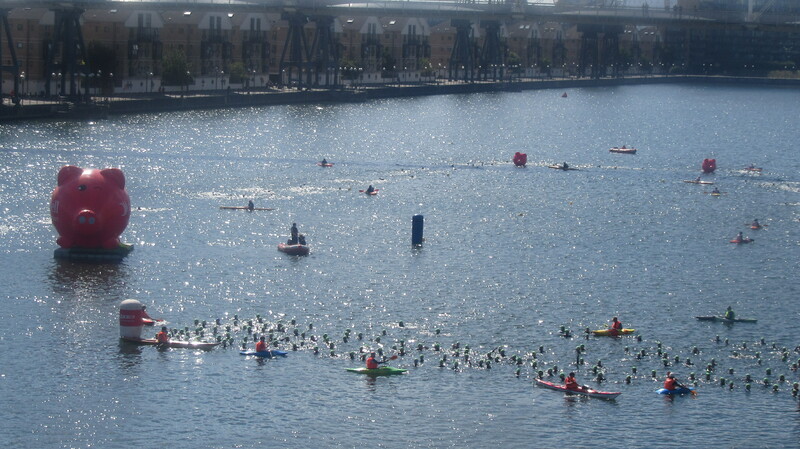 who’d completed the London Triathlon in 2015, invested in some open water swimming lessons at Royal Victoria Dock. At our first session, coach John from RG Active told us we’d already done more preparation than some people who’d be on the London Triathlon start line because we’d have trained in open water. I knew the water would be different to swimming in the pool but I hadn’t realised I’d need to learn to swim differently. Another swim skill to acquire. 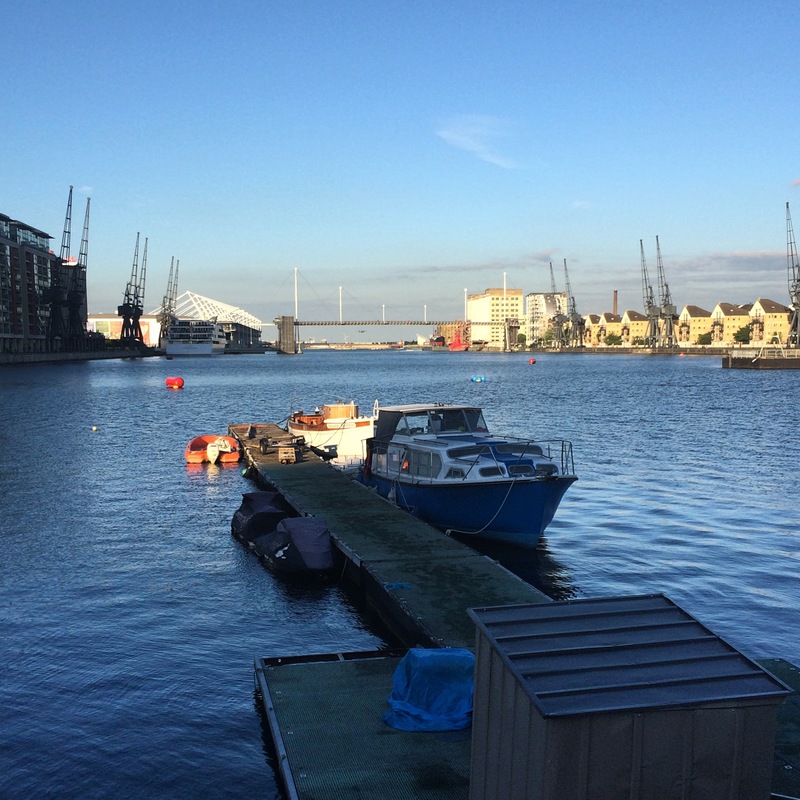 I joined the weekly swim sessions on Tuesday evenings, took myself and my wetsuit to the lido two or three times a week, and continued cycling 12km each way to and from work. In between that, and everything else I was doing for Freyathlon, I added a few brick sessions (bike/swim/bike or bike/run) so my legs became more accustomed to the transition from different activities. Trace and I arrived at Eton Dorney on a hot, sunny afternoon. I would have liked a cool, overcast day – maybe even a bit of rain. After collecting my time chip and ankle strap, I said hello to Sarah and the rest of the Cyclists Fighting Cancer team. Sarah’s daughter Tillie showed me the medals and trophies and told me confidently there was a good chance I’d win something. I wasn’t so sure. I checked how much water I had, again. 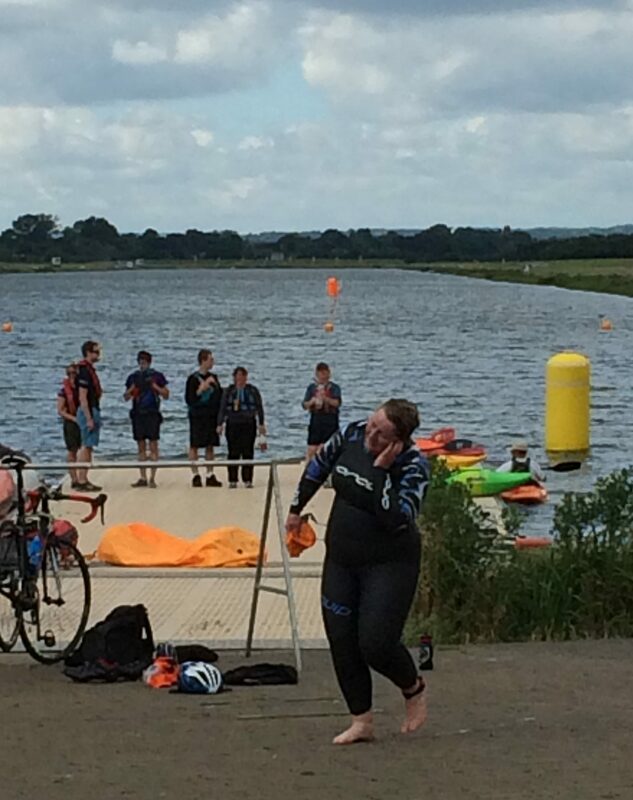 Wearing a trisuit presents a few challenges when you need the loo. And the challenge was magnified by my commitment to hydration, anticipation of my first triathlon, and portable loos. I made three visits in less than 45mins. 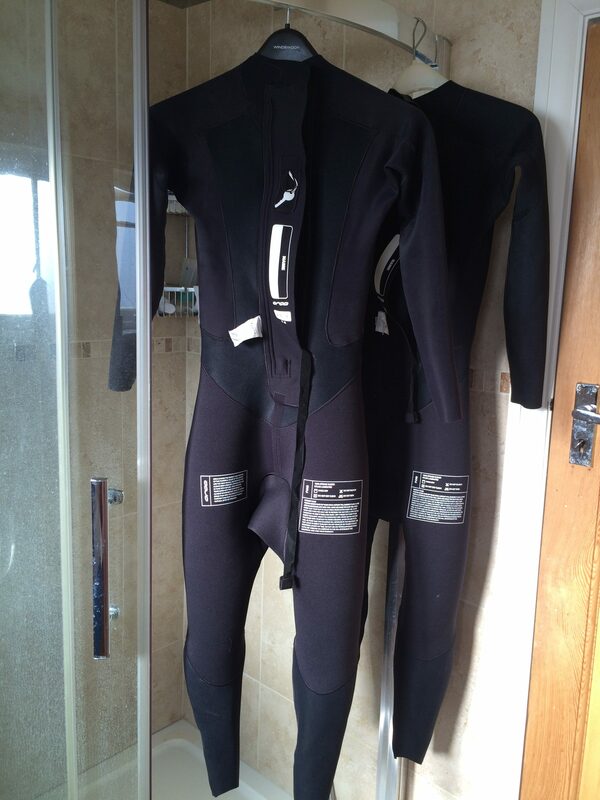 Before I finally decided enough was enough and squeezed into my wetsuit. My wave was called to the swim start and I waved goodbye to Trace. At the swim start, the race director outlined the route and explained how to enter and exit each leg of the triathlon. Then he asked who was doing a triathlon for the first time. I raised my hand, and about six other people did too. We grinned at each other and everyone applauded. We waded into the lake and waited for the start. I tried to remember everything I’d read and been told. And my mind was blank. I started swimming and, after a few strokes, spotted the rest of the group streaking away from me. I put my head down and swam steadily for about 10 strokes before glancing up. I couldn’t see the pack and started to get disoriented. I looked to my right and there they were, heading towards the buoy I was heading away from. I turned and started swimming towards them. When I checked again, I’d swum almost 180 degrees in the opposite direction and the pack were now on my left. The man in the canoe got me through the swim – thank you! I reached the buoy and could see the pack, some of whom were already at the swim exit. I struck out and found it easier on the way back – I’d got into a rhythm and could focus on the large club house at the end of the lake instead of a red buoy in the middle of the lake. The man in the canoe kept pace with me. He may have paddled backwards a bit to do that. And eventually I reached the bank and clambered up the ramp. As I pulled off my wetsuit in transition and pulled on my T-shirt and cycling shoes (talcum powder in the socks is a great tip to get dry socks onto wet feet), other people were coming in from the bike leg and heading out for the run. I shoved an energy bar into my back pocket, and pulled on my makeshift sunglasses arrangement. One lens from my prescription sunglasses had dropped out on my way to work a week earlier and I was wearing ordinary glasses under a pair of sunglasses. Not ideal but it would have to work until I was able to get to an optician. I was happy on the bike and, after shovelling in a bit of an energy bar and some water, focused on getting up some speed and trying to catch some of the riders ahead of me. I overtook a few cyclists but wasn’t sure whether they were doing the sprint (four laps) or the super sprint (two laps). On the second lap I overtook no one, and thanked the volunteers as I cycled past. Back in transition, I swigged more water and changed out of my cycling shoes and into my trainers. 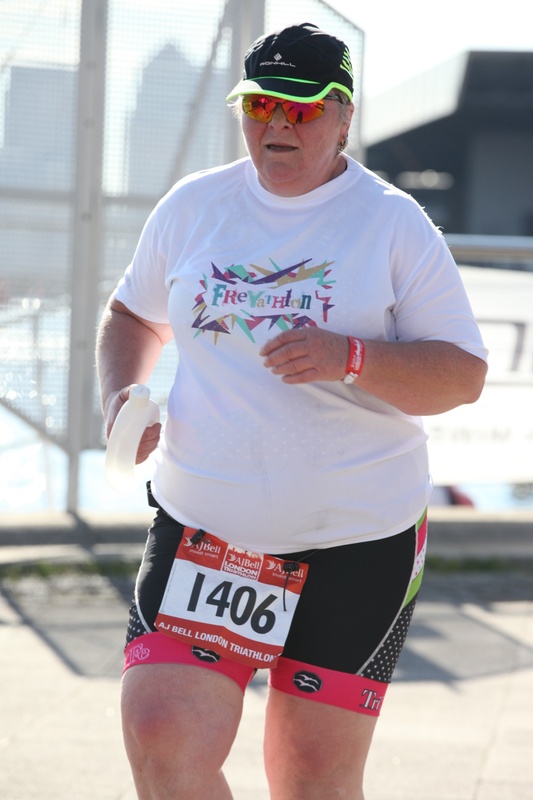 I was feeling good and reminded myself I was about to complete my first triathlon. I picked up my water bottle, slapped on my cap, and headed off. All I had to do was run up one side of the lake, turn at the sign and run back down. It all seemed so simple. As I made my way along one path, people coming back down on the other path to finish their run, called out to me: ‘Well done’, ‘Keep going’, ‘You’re doing really well’. It helped. Particularly as the breeze disappeared and my legs became heavier. I kept watching for the turn point and started to worry I’d passed it. I tried to calculate how far I’d come along the bank but couldn’t work it out. Eventually I spotted a man sitting on the ground beside a sign with a big arrow. ‘Am I pleased to see you,’ I said as I turned. And realised I still had to run back. I say ‘run’. I do more of a trot on a good day, and this wasn’t a good day. A couple of women came running past me, at a pace I’ve never reached and I realised they were finishing the sprint distance. On I went, with the club house in the distance. The problem with a flat course is you can see the finish line from a long way off. The problem for me was it seemed to stay a long way off for a long time. I watched cars driving away, loaded with bikes, and families sitting along the path, now joined by people who’d completed the triathlon. People applauded and I waved, determined I wouldn’t start walking – even if it would have been difficult to tell the difference. Suddenly I heard Trace’s voice and looked up to see her beyond the finish line, holding up her phone to capture the moment. I ran towards her, with a big smile. 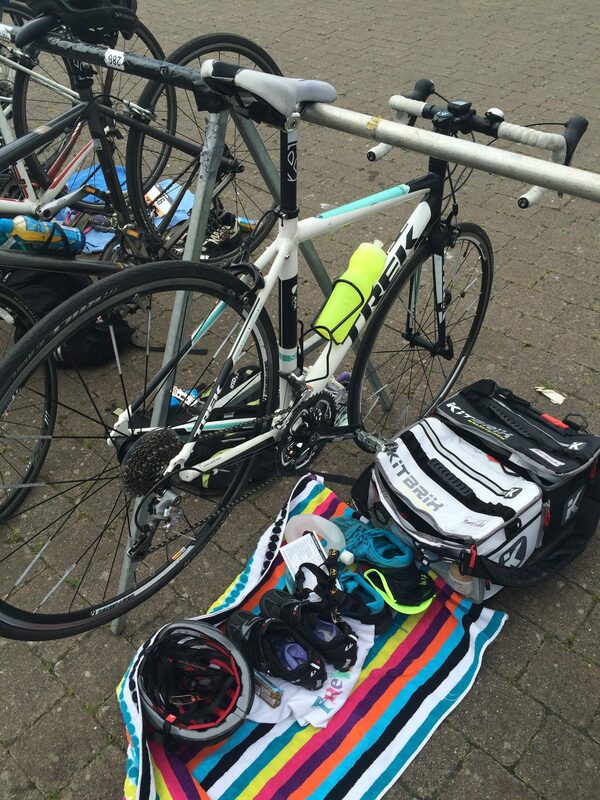 I had finished my first triathlon. At my next open water session I told John how difficult I’d found it sighting the buoy and swimming in a straight line. ‘We’ll do some sighting drills,’ he said. And we did. He got us to swim like crocodiles with just our eyes out of the water, then got us to look ahead between breaths so we could check our position without turning our heads. It wasn’t easy. In the pool I practiced the sighting drill with a bright yellow water bottle and it helped. I booked a 1:1 session with John and we covered some of the tips and techniques he’d shared in the group sessions. He watched me from the dock then in the water as he tried to work out how to get me swimming better and faster. I swam. He held my ankles together, and rotated my hips from side to side in time with my stroke as I raised my arm over my head. It felt so different and I felt as if I were gliding through the water. When we stopped, I said: ‘You were kicking, right?’ But he hadn’t been. Simply by keeping my feet together and getting me to turn my body more than I usually did, I’d managed to move faster and more efficiently through the water. It felt brilliant. And I hoped some of it would stick for the London Triathlon. We arrived at the Excel centre more than two hours before our start time, and managed to bump into four people from our RG Active training sessions, my work colleague Jane (whose husband Brian was taking part in a team sprint triathlon, and was due to help me complete the Freyathlon kayaking in a few days), and John and Marsha – our coaches from RG Active. And my mother arrived to watch and support. Chatting and laughing with others helped take my mind off the task ahead, and watching the start of a few swim waves boosted my confidence. 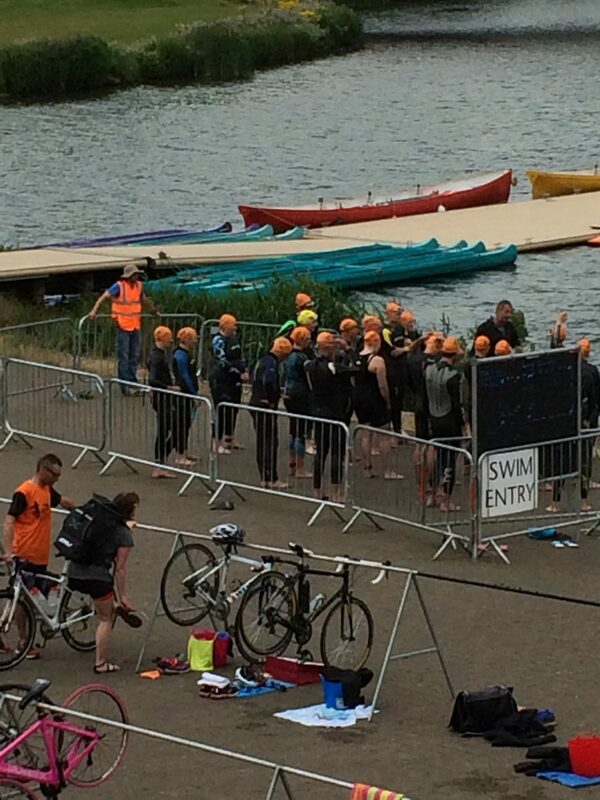 I spotted a couple of people being lifted out of the water within 100m of the start and, when I pointed out a couple of swimmers being lapped by the swim wave behind them, John said: ‘They’re going slower than you, Freya.’ He was right. Down in transition, Trace and I got ready for the start of our wave, and chatted to the women set up near us. One was used to swimming in the sea, another had completed a pool triathlon, and another had tried on her wetsuit once before. When we told them we’d been training in the dock for the past few weeks, they had plenty of questions. Being able to reassure them helped me – and I hope it helped them. At the swim entry, the race director gave us a briefing, got us laughing, clapping and waving, and wished us well as we headed out to the dock. I jumped off the pontoon and swam to the front and left hand side of the pack. I looked up to the balcony, trying to spot my mother but realised I had no chance without my glasses. Trace and I wished each other good luck and, once the horn sounded, we set off. I got into a steady rhythm and let people swim past on my right hand side as I kept an eye on the edge of the dock on my left. Half way along the first side I started to move across to be closer to the rope marking the course. A few more swimmers passed me as we neared the first corner and, underwater, I followed the legs of the woman in front across the top of the course. And remembered to check above water in case I was following someone who’d gone off course. She hadn’t and I didn’t. All was going well down the right hand side until I realised the buoy I’d been using as a marker wasn’t the third corner but the turn for the super sprint. My heart sank a bit but I pushed on. I heard the horn for the next wave to start and tried to increase my pace. John was in the wave behind me and I wanted to avoid him, and everyone else, swimming over the top of me. Just before the third corner I had a wardrobe malfunction. My swim cap was rising up on the back of my head and taking my goggles with it. I had to stop to pull the cap down and readjust my goggles. I rounded the final corner and headed for the pontoon. 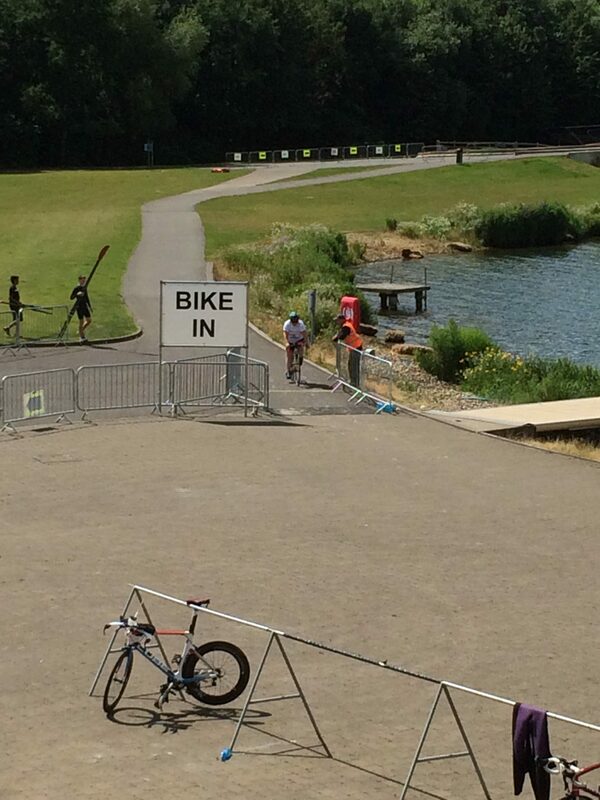 It seemed to take longer to get there than it had taken to swim the rest of the course. I clambered up the ramp and John ran past me: ‘Come on, Freya,’ he called over his shoulder. As I ran through the arch I heard my name again and looked straight ahead. Marsha was waving at me, holding up her phone. 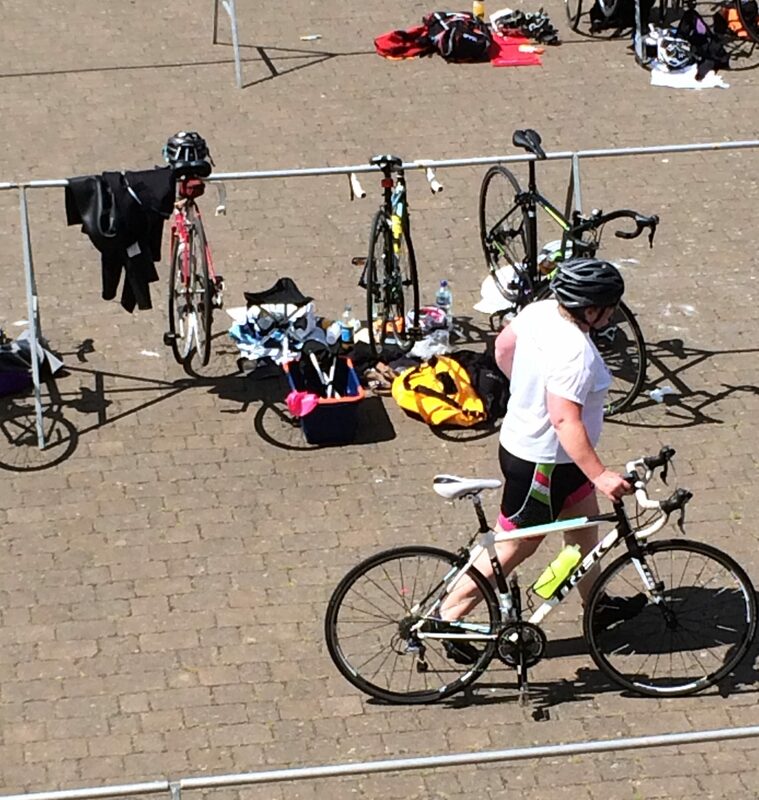 I waved back and started trying to unzip my wetsuit and bag it before heading into transition. Most of the bikes in my wave had already left but I knew this was my strongest leg and had the chance to make up some time. T-shirt and helmet on, energy bars stashed in my trisuit, race number fixed to my tribelt, I put on my cycling shoes and prescription cycling sunglasses (I’d managed to get to an optician), and headed out. 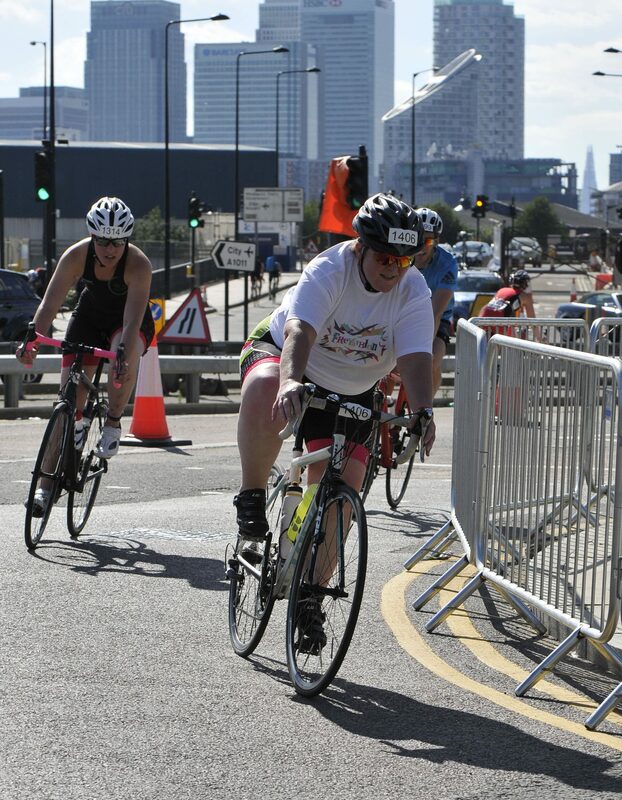 The descent from the Excel centre is a bit steep and has a few tight corners, and I was grateful I was at the tail end of one wave and the start of another – I imagine it could have been a bit sticky with more cyclists eager to get on the course. Over the years I’ve cycled around a fair bit of Beckton and Canning Town so the route was quite familiar. I kept the gears low to get my legs used to moving before pushing up and down the small climbs. I spotted Trace about half a lap ahead of me and used her position to measure how I was doing when we passed each other again. I snacked on my energy bars and sipped on water. I overtook a few cyclists and knew I was making up time. I had a bit of bike envy as some beautiful bikes passed me. I waved at anyone who called out from the roadside, not always knowing what they were saying but grateful they were there offering support. I felt strong finishing the bike leg and started to wonder how long it would take me to complete the run. I’d decided not to wear my watch for either triathlon because my aim was to cross the finish line, regardless of time, and the time chip would record my time. But both the swim and the bike legs had felt good so I was optimistic about the run. That optimism left me as I left the Excel centre and ran into the afternoon heat. It was late afternoon and there was no breeze. I tried to ease my legs into what they didn’t want to do. It was hard, and, looking at the other runners, it was hard for many of them too. Rounding a corner, I heard my name and spotted Jane, holding up her camera. I waved and tried to look OK. I remembered her telling me she’d really struggled with the heat when she’d run 10km as part of a triathlon team the previous year. I passed her and slowed down my pace, determined not to walk. To distract myself from the heat and discomfort I started calling out the names people were wearing on their shirts as they passed me on the opposite side of the course. Sometimes it worked and people looked up and smiled. Sometimes it didn’t and I knew they’d dug in and gone to a dark place. A couple of people said ‘well done’ as they ran passed me. They’d read the back of my T-shirt. One women said: ‘Good on you. Which number is this?’ It was 36 of 41. 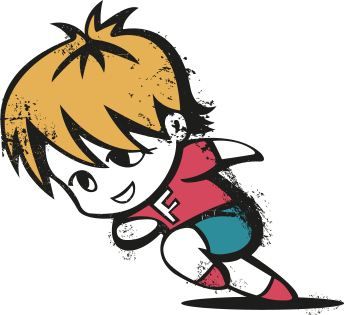 I still had to complete athletics, canoe slalom, canoe sprint, rhythmic gymnastics, and sailing. 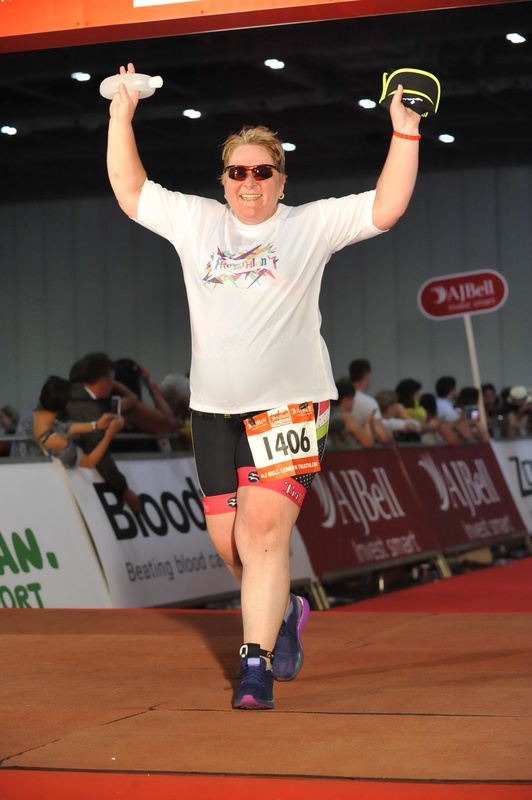 After I turned back towards the Excel centre, I started high-fiving anyone standing along the course and thanked anyone who called out my number. If you’re ever watching a run and see people not having a great time, call out their number. It helps to know someone has seen and noticed you. As I passed the Macmillan Cancer Support tent, I told them I was running for them and called for some support. They clapped and cheered. Up the ramp into the Excel centre, knowing I had to do it all again. Out and back down the ramp, there were fewer people on the course. And fewer people whose name or number I could call out. A woman overtook me. She was walking, fast. I laughed and told myself it didn’t matter. I didn’t need to compare myself to anyone else. I dug in and thought about the two half marathons I’d run, the first 10km, the first 5km, the first 52mile bike ride I’d done after moving into remission, the weeks on end I’d spent in a hospital bed going through chemotherapy treatment. That got me back round the course and up the ramp. As I entered the Excel centre I spotted my mother. I took off my cap and shouted. And shouted again as I got nearer. She heard me the second time, waved, and lifted her camera. I ran on towards the finish line and heard Trace call my name. I looked up and saw her waving and taking photos on her phone. I held my arms up and crossed the finish line.